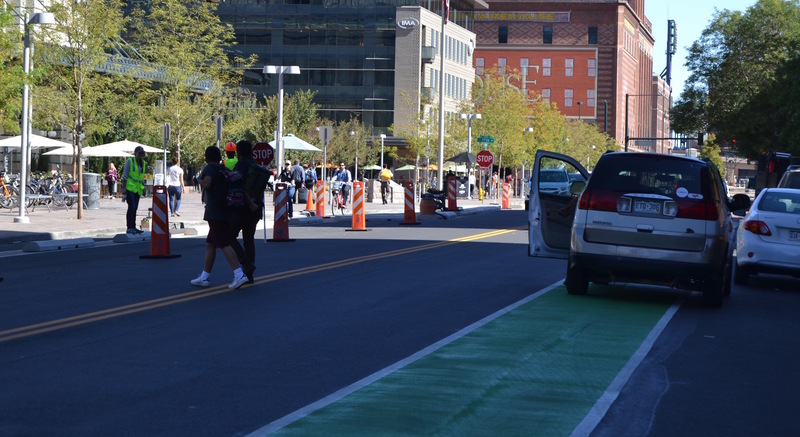 Say farewell to the strange bike lane-protected gutter Denver Public Works installed on Wynkoop Street in front of Union Station last year — a head-scratching piece of an otherwise good design to make the area safer for walking. Say hello to curb-buffered bike lanes on the Union Station side between 16th and 18th streets to protect people on bikes on a hectic street where drivers typically cut them off as they pick up and drop off passengers. On the other side of the street, a Kermit-green painted bike lane — with no physical protection — is a slight improvement over the unpainted standard lane. But it doesn’t stop drivers from parking in it and sending bicyclists back into traffic. As Streetsblog reported earlier this year, the new design prioritizes parking over people to an extent. There’s not enough room to protect both bike lanes from traffic, or build a two-way protected bike lane on one side of the street, without removing parking spots, according to DPW. 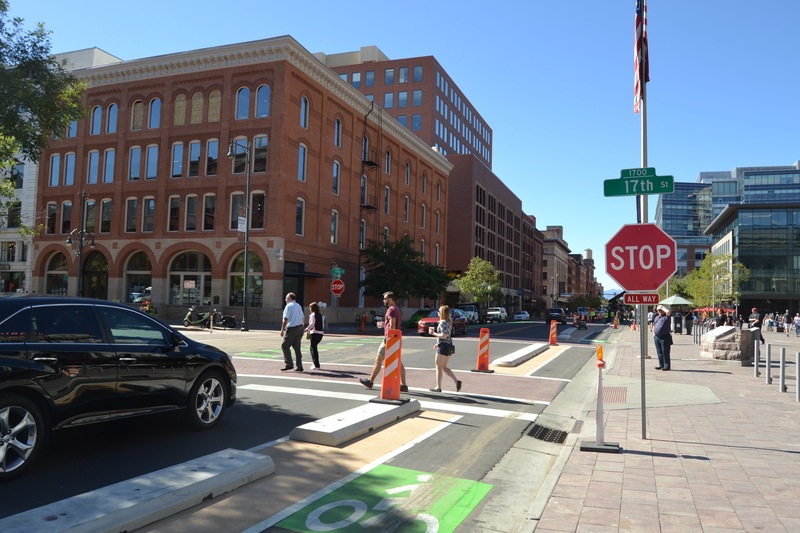 Another little improvement: People biking west on Wynkoop toward the Cherry Creek Trail won’t have to worry about drivers treating the bike lane as a right-turn lane at the intersection of 15th Street. DPW is adding plastic posts and some paint to repel cars from the lane. DPW will add the same treatment to the eastbound bike lane at 19th and Wynkoop. End to end, Wynkoop will have bike lanes from 15th to 19th when the project is done, probably by the end of the month. Judging by the 4-5 cars I saw in about a half hour last night drive straight through the bike lane between the protective curb and the streetside curb, there will be a learning curve. Enforcement should be strict and more signage might be needed. Unbelievable behavior. In my time downtown over the last few years I have seen far more than 4-5 bicyclists completely ignore common traffic laws and create many dangerous situations that could have ended-up with the bike rider badly injured or dead if it hadn’t been for thousands of car, truck, and bus drivers taking immediate evasive action too. In-fact just in the last 4 years I have seen more than 4 or 5 pedestrians with the right of way in a crosswalk get mowed down by bicyclists running red lights just at the corner of 14th and Larimer, and I am only there twice per-day for a minute or two each no more than 4 days per-week maximum too. The only people the bikes need to stop for in the 17th street example is pedestrians. Now that all of the curb barriers are in place, I’ve seen a huge improvement to my commute, riding south towards 15th, around 5PM. It’s not perfect, but in almost every way it’s a significant improvement. Problems: 1) Right before the zigzag at 17th, the bulk of the bike lane is occupied by a manhole cover recessed 2″ below the asphalt. 2) Pedestrians seem completely oblivious to bike traffic there. 3) UPS still parks in the bike lane just south of 16th, forcing bikes to veer into traffic. The bollards and paint at the corner of 15th have finally stopped drivers from trying to turn the bike lane into a turn lane (which was preposterous–it’s impossible to turn right on red at 5, and once the light turns, it’s impossible to turn until all the pedestrian traffic clears the crosswalk–so zero time gained for blocking all bike access in the interim). Barring major changes to parking, the only improvement I can see being practical would be some kind of permeable pedestrian barrier that would make them think about cross traffic, without forcing them to crosswalks only. Lacking that, I’ve had some luck with my Timberbell clanging constantly with bike motion, but may have to dust off my old AirZound for the headphone users. England solves the problems of paragraph 2 by giving bikes and pedestrians their own cycle during traffic light changes. They do this everywhere, not just in big cities.